This is the more commonly known color form of 'L. iridollae'. Its common name 'Pot of Gold' fully describes this flower. The Florida Panhandle, were these photos were taken, is also known habitat of Agkistrodon piscivorus, or more commonly known as Cotton Mouth. They do not always take delight in explorers disturbing "their" lilies. 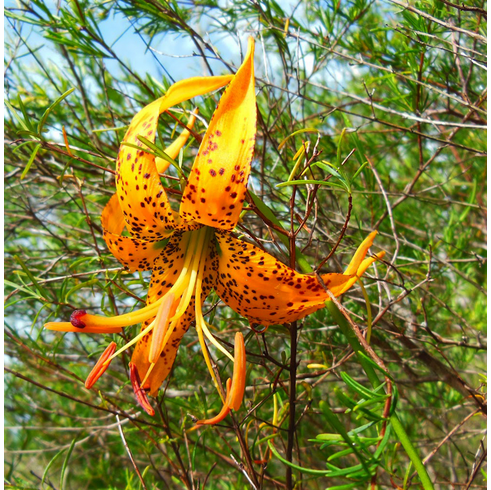 Photo insets show the importance of being near water for this lily though they always have their "feet" on dry land. Title photos as well as inserts #1 and #2 copyrighted Peter Zale, all rights reserved. Used with permission. Photo inserts #3 and #4 are courtesy of and copy righted by Mike Creel, all rights reserved. Used with permission. Mike grows both L. iridollae and L. catesbaei in a man made dry bog when they thrive for him. Insert #4 shows L. iridollae being visited by Papilio appalachiensis.